A variation on our natural theme. Foliage in lovely shades of blue & silver, white dusted cones & berries, goose feathers, silver birch slithers plus lots of sweet woodland finds are all to be found in our stylish winter whites/silver shades wreath. 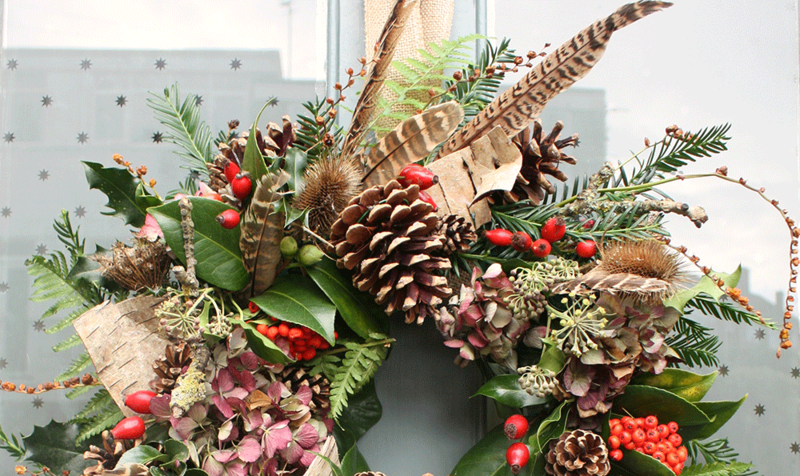 Featuring fragrant Blue pine & eucalyptus, silver birch bark, goose feathers, white dusted cones & berries. 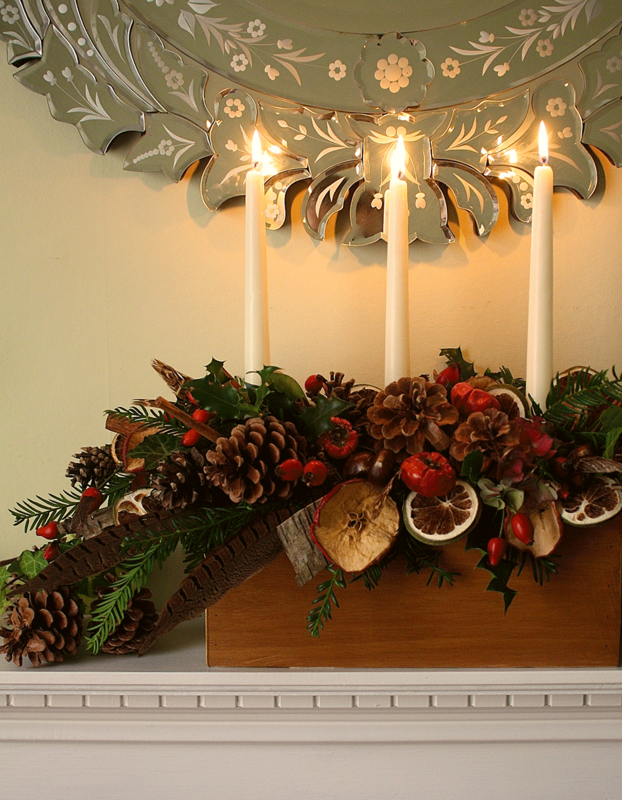 Our mantle piece arrangement, including your choice of one central 8” pillar candle or 3 tapers, is created using a simple light reflective galvanised container, to create a stylish festive flourish. Can also be adapted to adorn your dining table. Let us know when ordering where you would like yours to sit. A lovely selection of seasonal finds. All of our wreaths come with long natural hessian ribbon for hanging. Amongst our selection of seasonal materials you will find, seed pods, teasels, thistles, dried hydrangea heads, rose hips, cinnamon bark, feathers, moss, cones in all sorts of shapes & sizes, berries in addition to a lovely selection of winter foliage. Table wreath with multi wick candle. Featured in our table decorations you will discover nestled amongst other seasonal finds, apple slices, chestnuts, slithers of natural bark, plus what ever catches our eye. Plastic backed for table protection. Including 8’ pillar candle or 3 x tapered candles + 3 spares. In amongst a festive selection of evergreens, you will find pine cones, bark, berries, hips, pheasant feathers, dried fruits with additional flourishes of woodland discoveries. These boxes are primarily designed to adorn mantle pieces but can easily be adapted for glowing dinner tables. Due to the bespoke nature of our work variations will occur. Things may change but the quality remains.